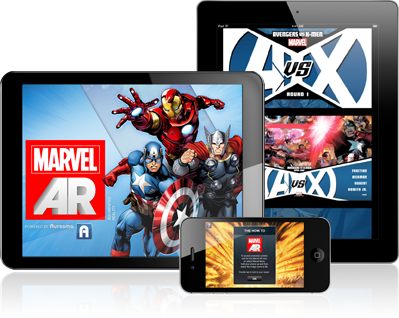 Age of Ultron is writer Brian Michael Bendis’ swan song on the Avengers franchise. 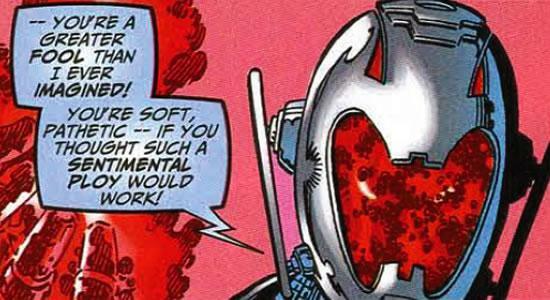 Ultron is the ultimate archenemy of Earth’s Mightiest Heroes. Beside their destruction all it wants is the eradication of mankind and the coming of a machine age. The story so far – Ultron has won. We all woke up one morning and everything was different – we were living, dying, or worse, in the Age of Ultron. Check out last week’s review here for the details. See my new review of Book Two, and more, after the jump. First off, it’s worth mentioning that we have lost the glossy cardstock cover we had last time, yet the price tag remains $3.99. I guess you could say we got an extra bonus for our first issue. That said however, our page count drops by eight, but the two-page spreads that are artist Bryan Hitch’s widescreen trademark from his Ultimates days remain in play, perhaps aggravated by Bendis’ penchant for the same. This really bothers me. I like the art, and I love the movie blockbuster panorama of the visuals. I just want twenty-odd pages of story to match the twenty-odd pages of art. Now we’re getting about ten to twenty in my estimation. Now I’m just not bitching to hear myself type. I do have a solution in mind, and I think it’s a perfect solution when dealing with a visual genius like Hitch. We have this amazing new technology – AR – Augmented Reality. I think it’s being used in most of the Marvel NOW! titles that are on the shelves. Why not use this new phone activated special effect to show off these fantastic two-page spreads, yet keep them normal sized on the page. Make it big with your phone, but give us twenty pages of story to match the twenty pages of art. What do you folks think? Last issue we were in post-Ultron Manhattan with Hawkeye, and a Spider-Man (we’ll get to that later) fighting for their lives against Ultron’s Sentries, and second rate villains trying to sell them to the robot overlord. This issue, we switch coasts to post-Ultron San Francisco with the Black Widow and Moon Knight. I do like the Bronze Age nod to the Widow being in her old seventies stomping grounds, nice touch, Bendis. Bryan Hitch’s San Francisco, click to enlarge. And speaking of San Francisco and AR, I was very disappointed to see no AR logo on pages two and three depicting a gloriously devastated San Fran that was painstakingly detailed and unmistakably SF. Hitch is a brilliantly talented artist, and this would have been a perfect moment for AR to work its magic. Moon Knight and the Black Widow have been assassins in their various lines of work over the years, so it did not bother me as much to see them murder a man on the street as much as it did when Hawkeye did it in the previous issue. However, I was bugged when Natasha stole a candy bar from a dead man. I know Bendis was trying to show us the desperation of our ‘heroes,’ but theft from the dead seems so out of character for the Widow, especially for a Twix. A Snickers, maybe I could forgive. Moon Knight, without his Knonshu gear, and the Black Widow, horribly scarred, probably from a clash with Ultron or his minions, have taken refuge in one of Nick Fury’s many safehouses. Again, I must yield to Bendis for his vast comics knowledge. I just wish we saw more of it, and that it had just a tweak or two of continuity acknowledgement on the side. I loved that the hideout is deep beneath a barber shop with no paper trail. You can almost smell the Steranko. The three hundred pound gorilla in the room during this scene is the bulletin board, supposedly used by Fury during the Secret Invasion. 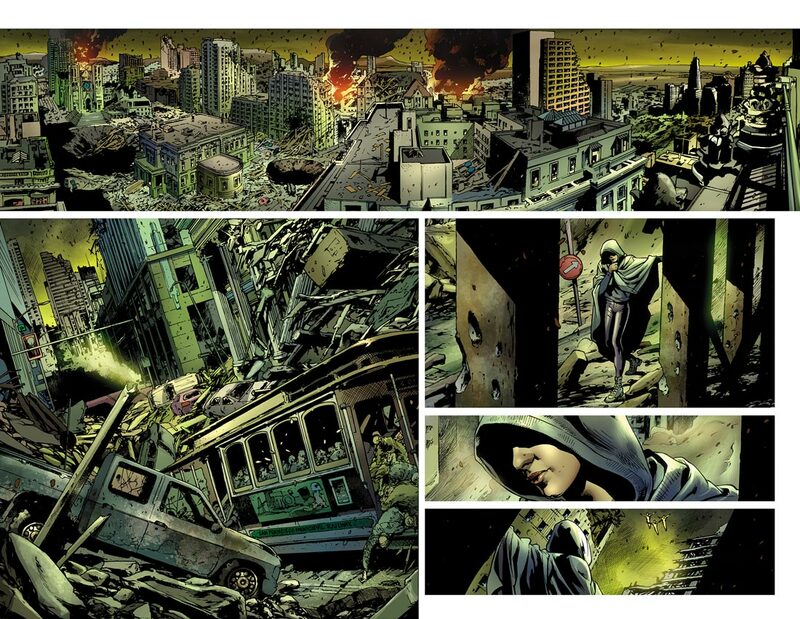 This two-page spread is AR, and was notably teased in the comics press a few months back. 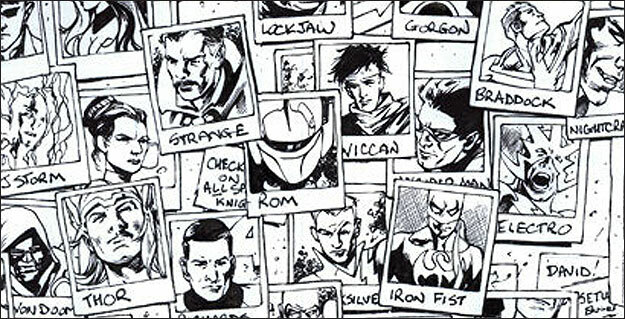 There are dozens of photographs of various Marvel heroes and villains, not just Avengers, with their names beneath them. When this image appeared in the press it caused quite a ruckus because dead center of the pic is Rom the Space Knight, now altered slightly and labeled ‘Ikon.’ Rom was a fan favorite that Marvel no longer has the rights too, and this had a lot of folks excited. I suppose Marvel still doesn’t have the rights to Rom, based on the edit. I’m guessing that Ikon is a yet to be seen Space Knight? My other gripe about the page is that Moon Knight mentions that Fury marked those he could trust in blue and those he could not in red. All the photos I see are in black. I also noted that some are marked with names Fury would have used, like Rogers for Captain America, Stark for Iron Man, yet similarly Hawkeye is not Barton, and Spider-Woman is not Jessica, but I suppose I’m nitpicking. Last issue, and last review, I expressed my opinion that the Spider-Man depicted in Age of Ultron was absolutely Peter Parker. 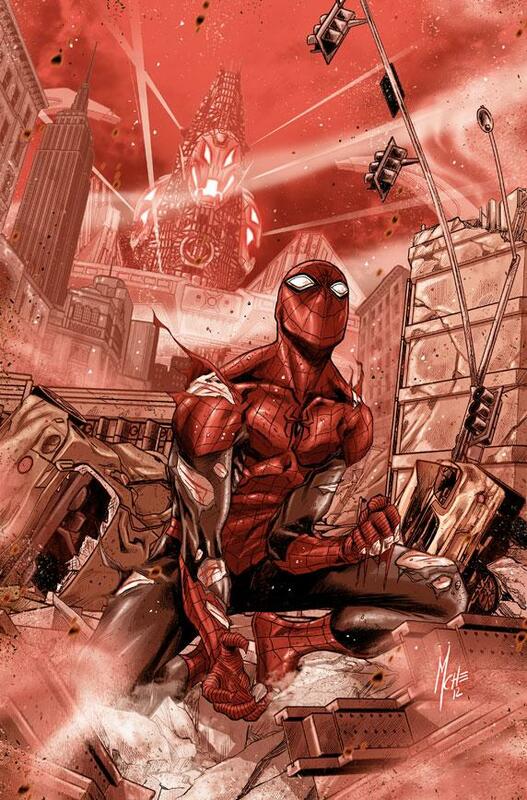 However, in an interview at Newsarama, that appeared the same day I posted my review, Bendis maintained that the Spider-Man in Age of Ultron is Superior Spider-Man, with Dr. Otto Octavius in the pilot seat. For folks not in the know, Spidey’s archenemy Dr. Octopus controls Spider-Man’s body now, with Peter Parker an unwilling and completely trapped passenger in the back of his own head. In other words, it’s Parker’s body, but Doc Ock is in complete control. Now in the other comics I read with Superior Spidey, he acts like Doc Ock, arrogant, humorless, basically like the tag says – superior. It seems pretty universal. Except here in Age of Ultron, where the character, despite Bendis’ claims, seems definititively Peter Parker. The dialogue is Peter’s, he even says he’s “really glad to see you guys” to what currently passes for the Avengers, and refers to the grouping as “us.” I’m not even mentioning Hitch’s drawing Spidey’s old costume, and depicting his apartment as messy, a trait I doubt Octavius has. Bendis says it’s Otto, so I will just squint and read his lines as Otto. Has anyone noticed that Age of Ultron does not carry the Marvel NOW! logo? What could that mean? With all this talk of time travel, changing the past, and possible reboot – is it possible that the events of Age of Ultron could result in the Marvel NOW! universe? Perhaps the changes are subtler than we thought. Something to think about. 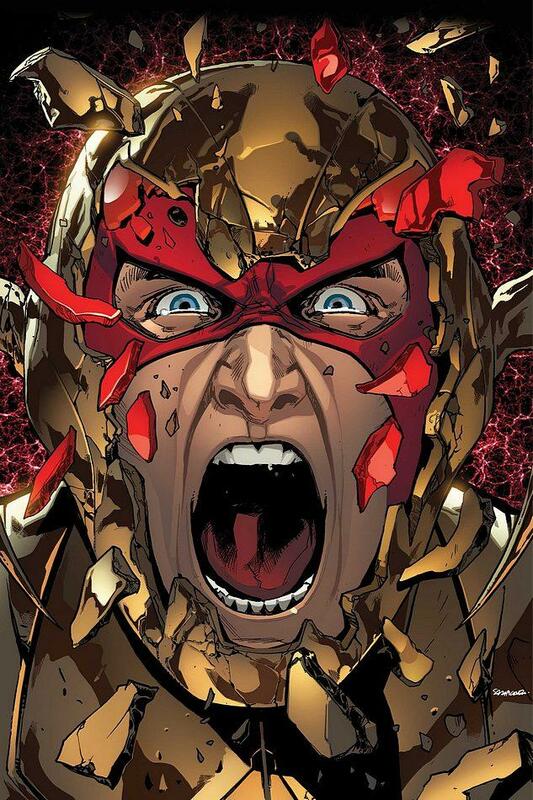 This also might be the time to talk about Ultron’s new look, or his recent look. There has been a redesign, I would say since he popped up as a clone of Jan in Mighty Avengers #1. I have always thought that Ultron’s original look, designed by John Buscema and refined by George Perez, is both simple and terrifying. The new sleeker version – not so much, just my opinion though. I am also feeling the death knell for Hank Pym again, especially considering the solicits for the end of this series. Pym will be facing a major change and/or decision. 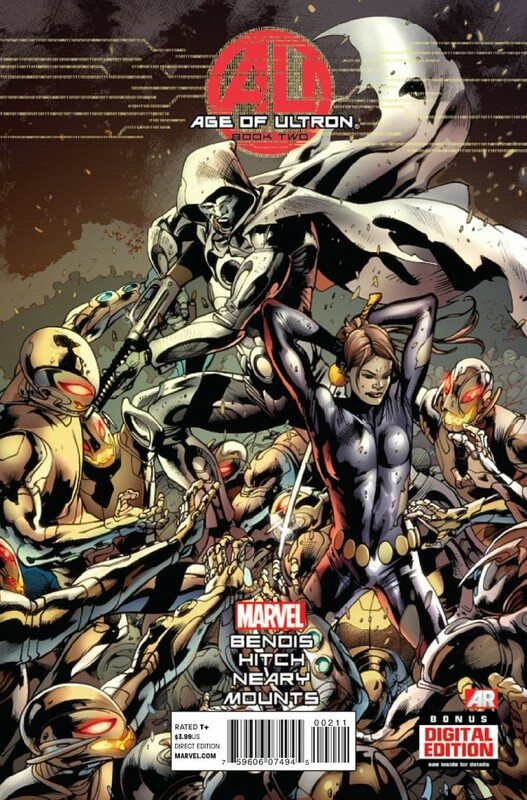 On one cover, he is seen under the armored face of Ultron trying to get out. 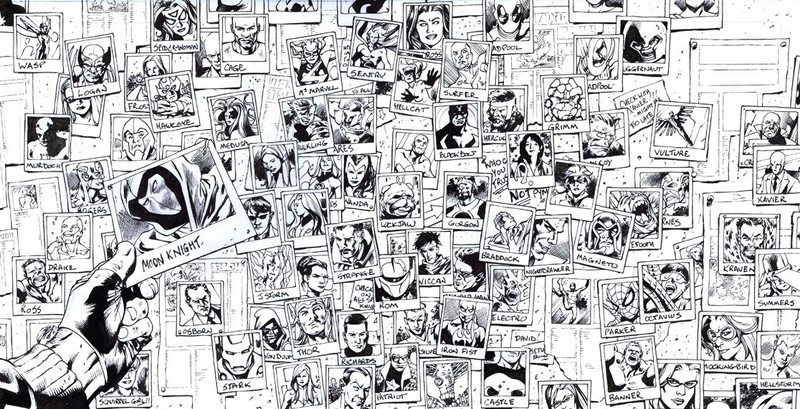 Here, once again on the first page, Bendis places the blame for Ultron solidly on Pym’s shoulders, and on Fury’s bulletin board, it’s written, “Who can you trust? Not Pym.” This is not looking good for my favorite Avenger. Pingback: Mighty Marvel March: Age of Ultron Book Three | Biff Bam Pop! Pingback: Age of Ultron: The Ghost of Avengers Future | Biff Bam Pop! Pingback: Age of Ultron: Back to the Future | Biff Bam Pop! Pingback: Age of Ultron: The Wolverine Paradox | Biff Bam Pop!